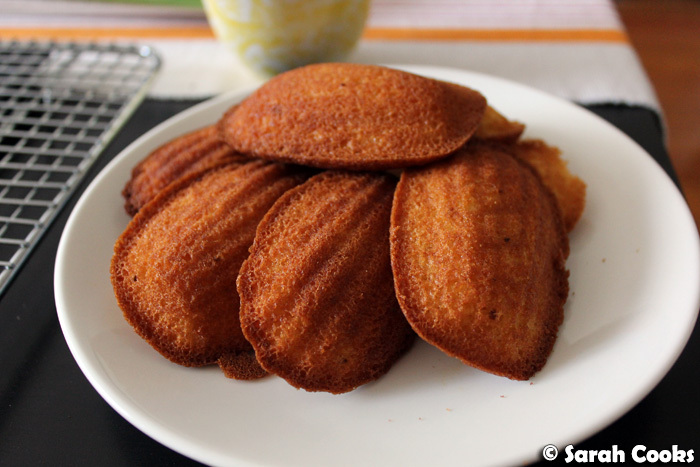 It's no secret that I love madeleines - I own three different madeleine trays, and I've blogged them six times already! (Seven if you count the madeleine post from my How to Eat project). Chocolate madeleines, green tea madeleines, Nigella's plain madeleines, and of course, my favourite recipe: the Roux brothers' honey madeleines. I made them for my mum's epic birthday party in 2008, I once coated them in chocolate, and I once made them when I was clearing out the pantry. So, why yet another post on these delectable French cakelets? Well, immodest of me to say it, I know, but I've improved on the recipe and I'm super excited to share it with you! The secret? Burnt butter. You have to melt the butter anyway, so why not let it carry on cooking and take on that gorgeous burnt butter aroma and colour? 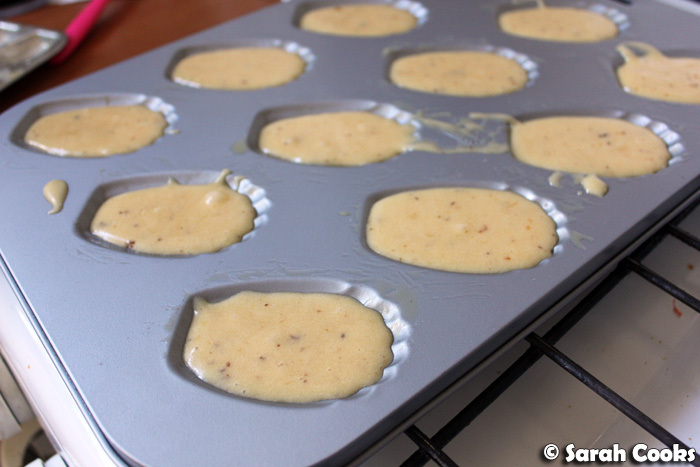 Easy easy and it gives the most amazing aroma and flavour to the little madeleines. ...and keep going, stirring with a heatproof spatula, until the hissing subsides, the milk solids separate (those are the little brown flecks below), and that lovely nutty, burnt butter aroma starts to waft up. You can see I was a little timid with my burnt butter and it was still light gold in colour; you can let it get a bit browner if you like. The aroma was definitely there though! Heaven! Now, to the madeleine mixture itself. 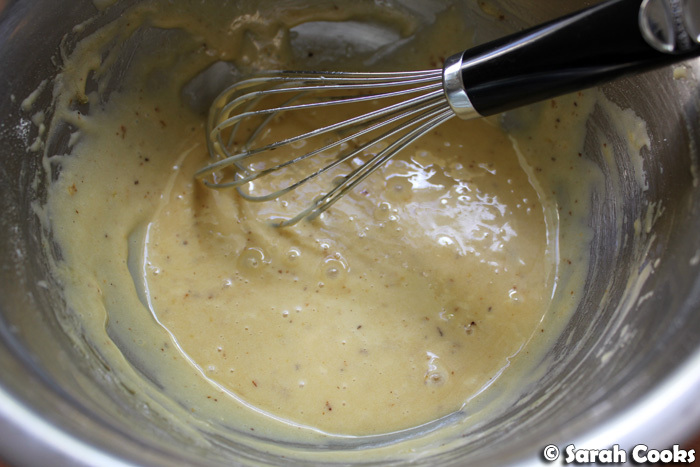 I've gone on about this before, but one reason I love the Roux Brothers' recipe so much is that it's incredibly easy, and all you need to do is whisk the ingredients lightly. They even explicitly state: "Don't overmix it", lest you start working too hard! It is so easy, in fact, that I whipped up this batch for a lazy weekend breakfast, when my eyes were barely open and I hadn't had my morning coffee yet. Perhaps the lack of caffeine explains the messy trays. Oops! Using a piping bag makes the tray-filling process faster and neater, but I was too lazy to fill the piping bag and just used two spoons. No matter, the end result was delicious nonetheless! Aaah... what a lovely breakfast! 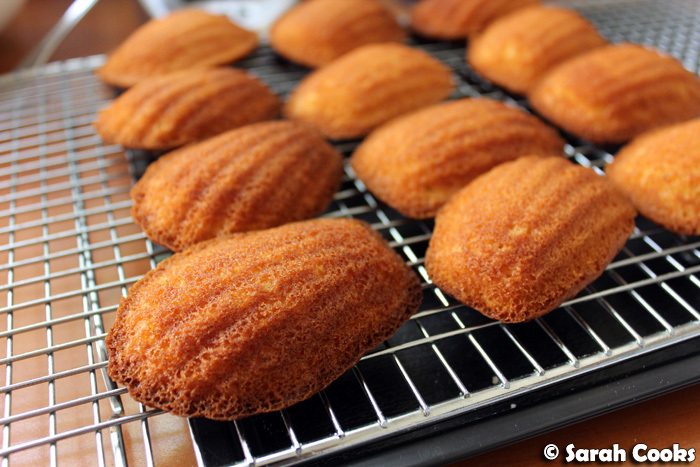 If you haven't made madeleines before, (or even if you have), give these a go! They're super-easy and so lusciously light and fluffy - a fab treat for breakfast or afternoon tea, so pretty and elegant. Enjoy! 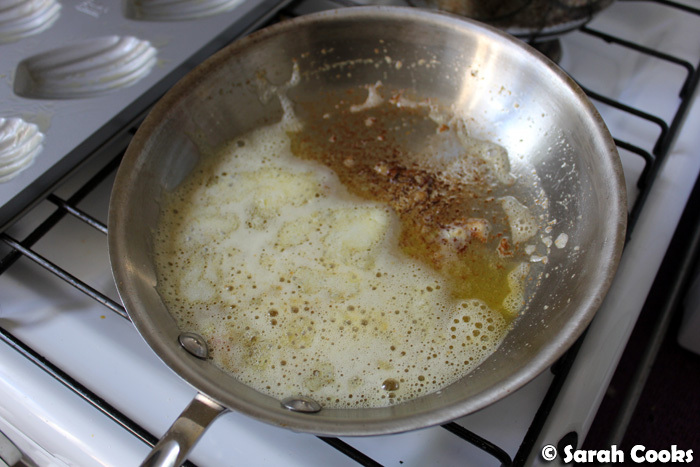 In a light coloured pan, (so you can see the colour change), melt the 90 grams butter over a medium heat. 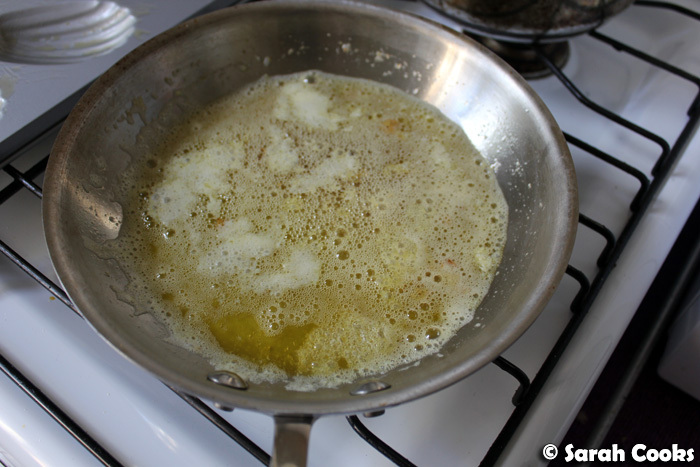 Continue cooking until the butter foams up and starts to sizzle, and the milk solids separate. Stir with a heatproof spatula to prevent the milk solids sticking to the pan. Once the sizzling has subsided and the butter had turned from yellow to a medium brown colour, (and most importantly, smells amazing), take off the heat and set aside to cool slightly. Place the eggs, sugars and salt in a bowl, and work lightly with a whisk until the ingredients are combined and the mixture begins to turn light in colour. 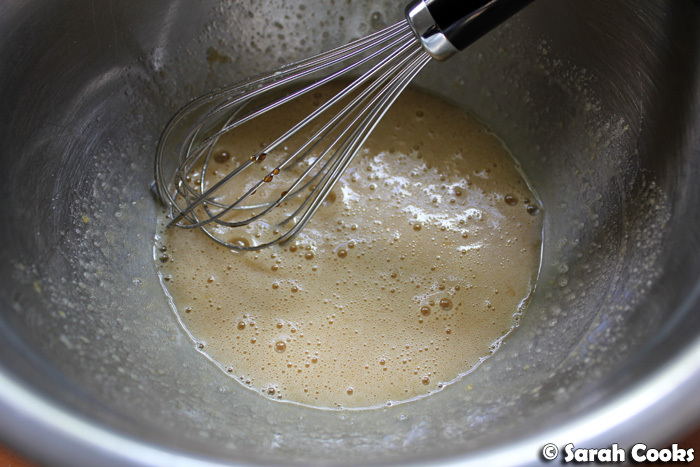 Sift the flour and baking powder, and fold them gently into the egg mixture. 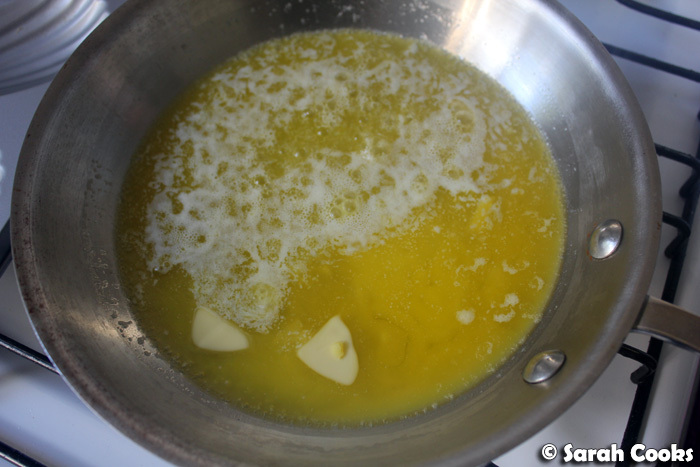 Add the vanilla, honey and melted butter, and mix gently until completely amalgamated. Cover the bowl with clingfilm and refrigerate for thirty minutes. Brush the inside of your madeleine tray with the extra melted butter. Spoon or pipe the madeleine mixture into the tray, filling the indentations about to just under the top. 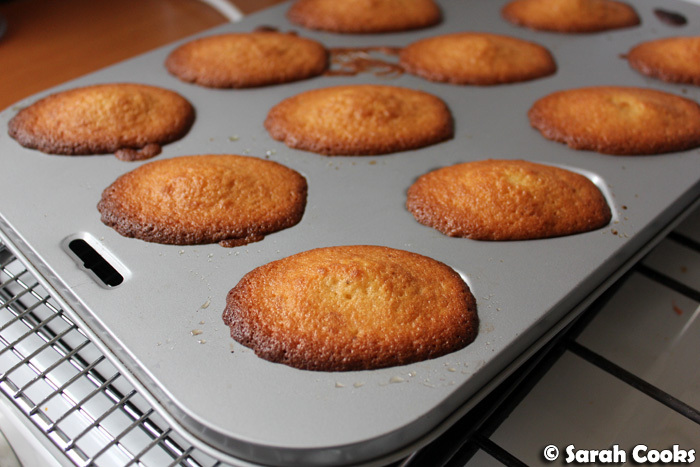 Bake for about 5 minutes (for small madeleines) and 10 minutes (for the larger ones). Be careful not to overcook them, or they will dry out. 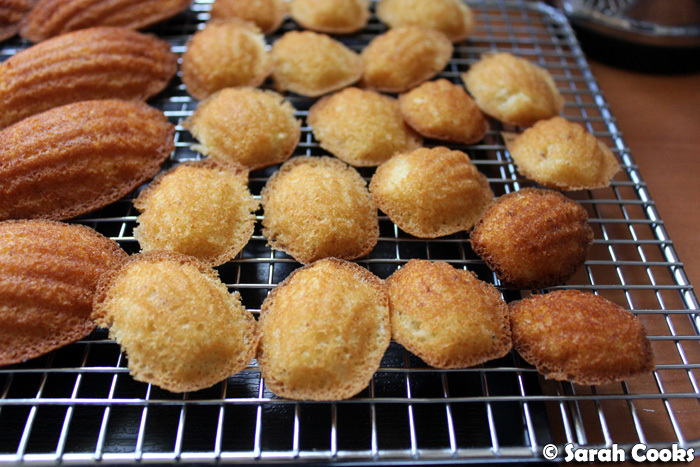 As soon as they are baked, invert the madeleines onto a cake rack. Eat as soon as you possibly can. What's that sound in the wind? "Peanut Butter Madeleines"? How odd, I hear that too! 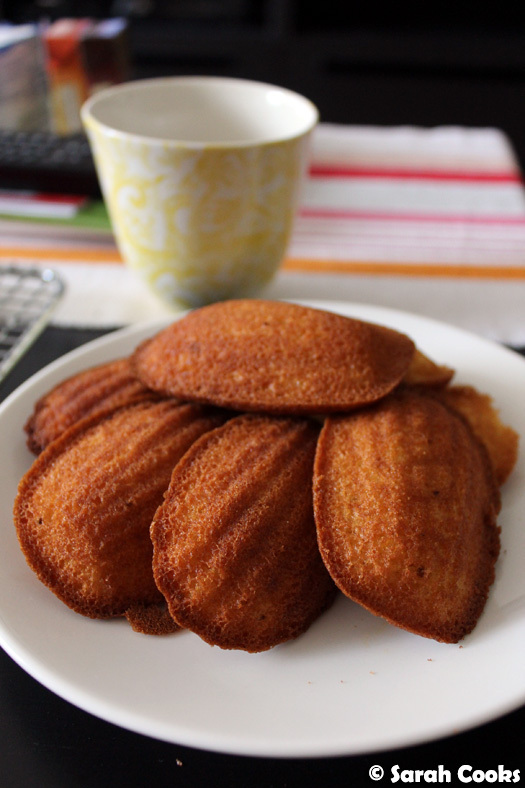 Ooh you make such perfect madeleines!!!!! You are the Madeleine queen! I've got 2 madeleine trays, but have yet to try them. I really must, soon.